It was a great start. I kind of overslept. I missed my alarm. Luckily, my pick up was late. 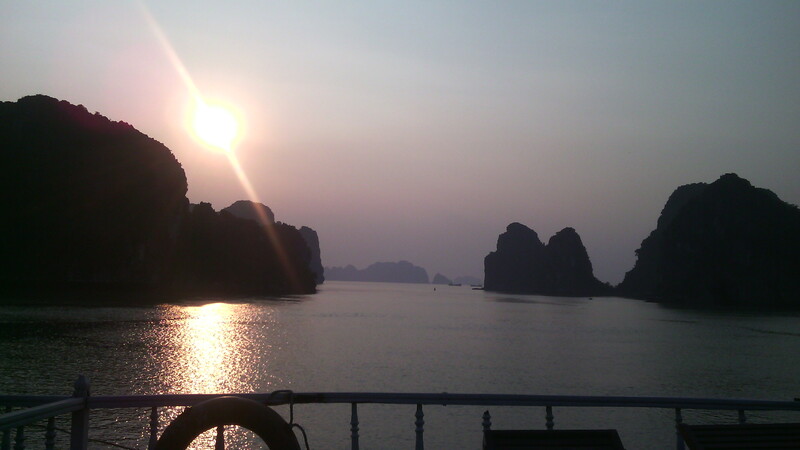 After rushing around andthe hostel making me breakfast, I started my journey to Halong Bay. As usual they stopped half way as some expensive place. Also, we had to collect some Swedish guys, who had over slept and they took a private taxi. At least I wasn’t one of them. We waited in the port for bit before mounting onto the boat. I was pleasantly surprised. It looked like the pictures in the brochure. First we had an awkward lunch, where no one was talking but the food was delicious: morning glory, whole fish, tofu, omelette, squid. While cruising during the afternoon, we stopped at a huge cave. The cave was amazing, probably the best I’ve seen so far but it was a bit disappointing with the disco lights even if it did look pretty. Next, we went to a tidy fishing village, where some of the locals could paddle people around through caves but that wasn’t part of the tour. One girl made a big fuss so I felt like I now couldn’t go. Laying on the sunbeds and admiring the scenery during sunset was amazing. We dropped off some people and collected other at Cat Ba. Then we ate dinner with similar food before being able to jump off the boat in the dark. I was surprisingly nervous at first but it was fun and the water was actually warm. In the evening, we all sat on deck getting to know each other, dancing and drinking complimentary beers. It was a good night. Unfortunately it was ruined by some of the guys getting too drunk, throwing a deck chair over board and a door being slammed in faces. The second day of the Halong Bay tour started with an early breakfast then kayaking in the sea. I was better than I had previously been. Paddling and floating along was lush with the morning sun gazing at us. We had a cooking demonstration on making spring roll, which all those who wanted to took part in before consuming them for lunch. After having some food, we cruised back to the port to get our lift back to Hanoi. A few of us from the boat decided to meet up for a few drink at a bar later on, where they also had shisha. The end of the night kind of turned as one of the guys were being extremely rude to everyone else so I decided to taxi back to the hostel.